Women who are thin are at higher risk of developing osteoporosis than are heavier women. Weight-bearing exercise such as walking helps maintain bone strength. Heavier women require their skeletons to bear more weight, so their bones are stronger than is the case for thin women. Ballet dancers are at particular risk, as are women who diet to be as thin as these dancers. Gwyneth Paltrow is an example of such a woman. In 2010 at age 37, she found out that she had osteopenia, the early stage of osteoporosis. 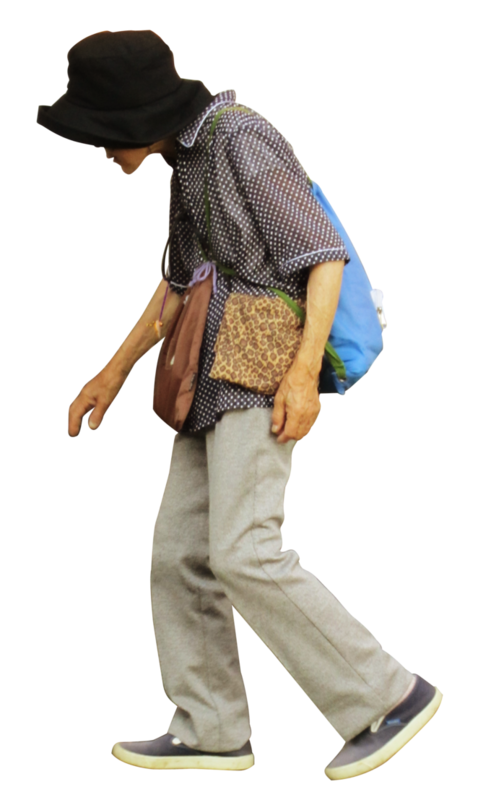 Woman with Osteoporosis: Hyperkyphosis, colloquially called a “dowager’s hump,” refers to an anteriorly concave curvature of the thoracic region of the spine. Osteoporosis is a disease of the bones that leads to an increased risk of fracture. In osteoporosis, the bone mineral density (BMD) is reduced, bone microarchitecture deteriorates, and the amount and variety of proteins in bone is altered. The three main mechanisms by which osteoporosis develop are an inadequate peak bone mass (the skeleton develops insufficient mass and strength during growth), excessive bone resorption, and inadequate formation of new bone during remodeling. An interplay of these three mechanisms underlies the development of fragile bone tissue. The form of osteoporosis most common in women after menopause is referred to as primary type 1 or postmenopausal osteoporosis. Primary type 2 osteoporosis or senile osteoporosis occurs after age 75 and is seen in both females and males at a ratio of 2:1. Finally, secondary osteoporosis may arise at any age and affect men and women equally. This form of osteoporosis results from chronic predisposing medical problems or disease, or prolonged use of medications such as glucocorticoids. Osteoporosis risks can be reduced with lifestyle changes and sometimes medication, or treatment may involve both. Lifestyle change includes diet, exercise, and preventing falls. Medication includes calcium, vitamin D, bisphosphonates, and several others. Fall-prevention advice includes exercise to tone deambulatory muscles, proprioception-improvement exercises, and equilibrium therapies. Exercise, with its anabolic effect, may at the same time stop or reverse osteoporosis. Osteoporosis itself has no symptoms. Its main consequence is the increased risk of bone fractures. Osteoporotic fractures are those that occur in situations where healthy people would not normally break a bone. They are, therefore, regarded as fragility fractures. Typical fragility fractures occur in the vertebral column, rib, hip, and wrist. The three main mechanisms by which osteoporosis develops are an inadequate peak bone mass (the skeleton develops insufficient mass and strength during growth), excessive bone resorption, and inadequate formation of new bone during remodeling. Primary type 1 osteoporosis is the most common type in post-menopausal women. Primary type 2 or senile osteoporosis is common in both men and women over age 75. Secondary osteoporosis may arise at any age as the result of predisposing medical problems or prolonged use of of medications such as glucocorticoids. Primary type 2 osteoporosis is twice as prevelent in females as in males, but secondary osteoporosis affects men and women equally. Risk of osteoporosis can be reduced by exercises such as walking and by taking vitamin D supplements. Fragility fractures are most common in the vertebrae, hip and wrist joints, and ribs. peak bone mass: Peak bone mass is the average bone mass of healthy, young adults. fragility fractures: Fragility fracture is a type of pathologic fracture that occurs as result of normal activities, such as a fall from standing height or less, suggesting a weakness of the skeleton.